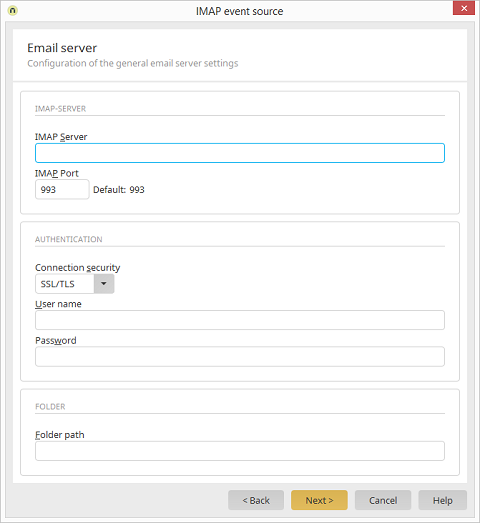 Configure the email server settings here. Enter the IMAP server host name here. Enter the port from which the IMAP server can be reached here. If SSL/TLS is selected for the "Connection security" option, the default port is 993, while non-secured connections use a default of 143. Select the degree of security here. Enter the login data for an IMAP user with sufficient permissions here. Encrypting the connection when communicating with email servers is very widespread. Therefore it usually is not enough to just insert the host name of the IMAP server when configuring an IMAP event source. In addition, the IMAP server's SSL certificate must be registered in the certificate store of the current portal (Portal / Portal properties / Certificates). After the registration is completed, the portal service needs to be restarted.